A cooperative effort of Virginia CLE and the Criminal Law Section of the Virginia State Bar, with financial assistance provided by a grant from the Virginia Law Foundation. 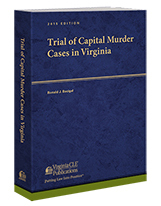 Authored by Professor Ronald J. Bacigal of the University of Richmond School of Law, and Jonathan P. Sheldon and Joseph T. Flood of Sheldon, Flood & Haywood, PLC, in Fairfax, this essential resource is both a guide for attorneys and a source of information for judges who are involved with capital cases in Virginia. The book includes several tables of relevant cases arranged by different groupings: by defendant’s surname; by degree of aggravation and mitigation; by aggravator; and by the section of the Virginia Code offended. There is also a section discussing ineffective assistance of counsel issues. If you handle criminal cases in Virginia where capital punishment is even a possibility, you should have this book. The eighth edition of this book will be published in January 2017, in print, CD-ROM, and USB flash drive formats and will also available for immediate download from the Virginia CLE website.